SAO PAULO: Lionel Messi kept running into a determined Dutch defensive wall on Wednesday but Argentina are still in the World Cup final and the little genius will get his chance to emulate Diego Maradona. A disciplined defensive display by the Netherlands ensured that the tense Sao Paolo semi-final was dragged into a penalty shootout that Argentina won 4-2 to set up a date with Germany at the Maracana stadium on Sunday. Messi confidently dispatched Argentina's first spot-kick, but before that he offered little, his enthusiasm dulled by the man-marking he was subjected to for the first hour by Nigel de Jong. If Messi can match Maradona and captain Argentina to World Cup glory this will be remembered as his tournament -- even more satisfactory on the territory of rival Brazil. But it was not his semi-final on a dreary and cold evening at the Corinthians Arena. The Barcelona man was pivotal in taking Alejandro Sabella's side to this stage, with his match-winning performances in Group F wins over Bosnia-Hercegovina, Iran and Nigeria. In the last 16, penalties loomed against Switzerland when his jinking run late in extra time set up the winning goal for Angel di Maria, and he helped set up Gonzalo Higuain's quarter-final clincher against Belgium too. But here, the tactical cunning of Netherlands coach Louis van Gaal snuffed out Messi's threat and ensured that this match became the first World Cup semi-final ever to end 0-0. De Jong surprisingly came back into the side just 10 days after tearing a groin muscle while playing against Mexico in the last 16 and was handed the task of shadowing Messi everywhere. For an hour, there were shades of Claudio Gentile's infamous performance against Maradona in Spain in 1982, when the Italy defender shackled the young genius as holders Argentina bowed out in the second phase. Against a superbly-drilled Dutch defence marshalled by Ron Vlaar, Messi only really threatened from an early free-kick that goalkeeper Jasper Cillessen saved. Even when de Jong was withdrawn and Jordy Clasie was brought in for his World Cup debut, Messi did not look like a threat, but fortunately for him Holland did not appear interested in trying to win the game. Messi will always be compared to Maradona, the captain of the Argentina teams that won the World Cup final on home territory in 1986 and were beaten by Germany in the final four years later in Italy. Wednesday's match saw Messi win his 92nd cap for his country, passing Maradona's total number of appearances and moving into sixth place in his country's all-time list. Maradona, of course, played in four World Cups altogether and won one. 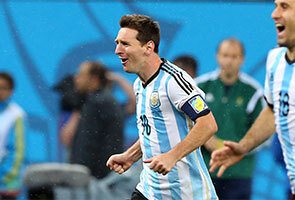 Now Messi, at the age of 27, is presented with the chance to equal his great predecessor. And if his individual performance was not up to his usual sky-high standards, he can surely expect to be afforded more space against a Germany side who, unlike the Netherlands, will have faith in their ability to really take the game to Argentina.